As I walked up the stairs into the darkened gallery of Alderman Exhibitions’ new loft space in an old warehouse on Randolph Street, I heard a long hissss and looked up to see a fuse burning in a shaky frame. I had walked in on the screening of Long Fuse, 2012, by Robert Chase Heishman and Brendan Meara. 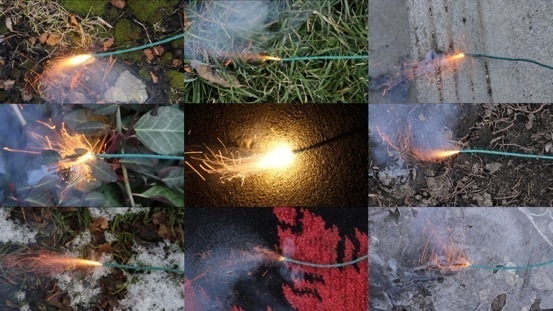 I perched on the top step and watched the fuse burn over snow, ice, grass, wood, concrete and soil. When was the bam, or kaboom, or, my favorite, kablooey!? When will there be resolution to this promise? The slow hiss became my mantra and Long Fuse became a meditation on expectation. My first connection to the work was the simmering Occupy movement that has grown slow like cold molasses in the hard winter months. The metaphor of simmering has long been used to describe social unrest in expectation but why not a hiss? Why not something that implies the most severe of possible outcomes? Besides, simmering water just evaporates, leaving residues. It may boil over, but it doesn’t blow up the pot. Like the expectation of Long Fuse, there is no outcome of Occupy yet, just a dénouement to an unknown but expected conclusion. The screen goes dark. As the film came to an end and the crowd adjusted themselves to the newly lit space, I walked over to Daniel Bauer’s works, Untitled (Haim’s Tree), 2010, and Nocturnal Gimcrackery, 2010. Nocturnal hides in geometry, craggy spaces and planes comprising a guarded façade. A blue light, tranquil and serene, suggests a soft depth behind the multifaceted walls. 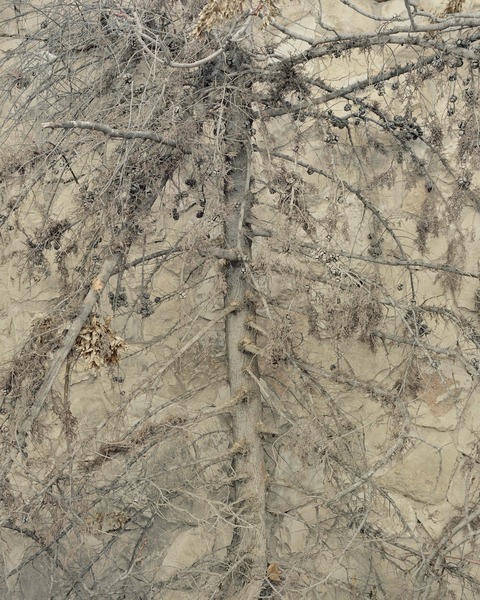 Daniel Bauer, Untitiled (Haim’s Tree), 2010, Archival pigment print, 34 x 40 inches. Fellow ArtSlant writer Steve Ruiz was standing there and upon seeing Untitled (Haim’s Tree) exclaimed, “Is that a photograph? !” He was relieved to see it was upon second glance. Both of Bauer’s works present in this group show of Alderman Exhibitions’ represented artists portray a tendency towards abstraction. Haim’s Tree looks frosted, mythical, like it should be gilded in gold, sprayed with snow-in-a-can and hung on a wall in grandma’s hallway. That may not sound flattering but I assure you, this photograph is breathtaking in that tragic, universal kind of way that guides both kitsch and high art. Complex and entrancing, it folds in nostalgia, momento mori, and an ardent full-frontal attack on representational photography. 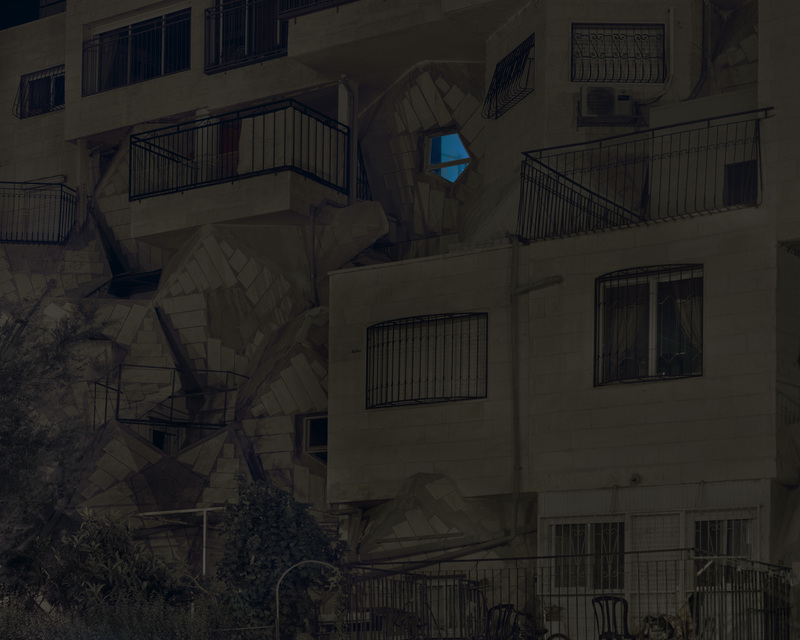 This is without even taking into account the topos of the images, Jerusalem, a place where architecture and walls take on a highly charged state. The tree looks to have moved the stones of the wall behind it, overcoming their cement with sheer age and patient growth. But the stones won in the end; the tree succumbed to their dusty beige. Irena Knezivic has a varied practice that ranges from performance to documentation. Her work often stems from her identity as Serbian and the subsequent fracture and loss of both identity and nation, steeped in complex histories that make and remake the past, present and future. The print present in this showing is Garden 2 from Various Instances of a Negligible Mistake, a series of photographs that began at the Belgrade Institute for the Mentally Insane. 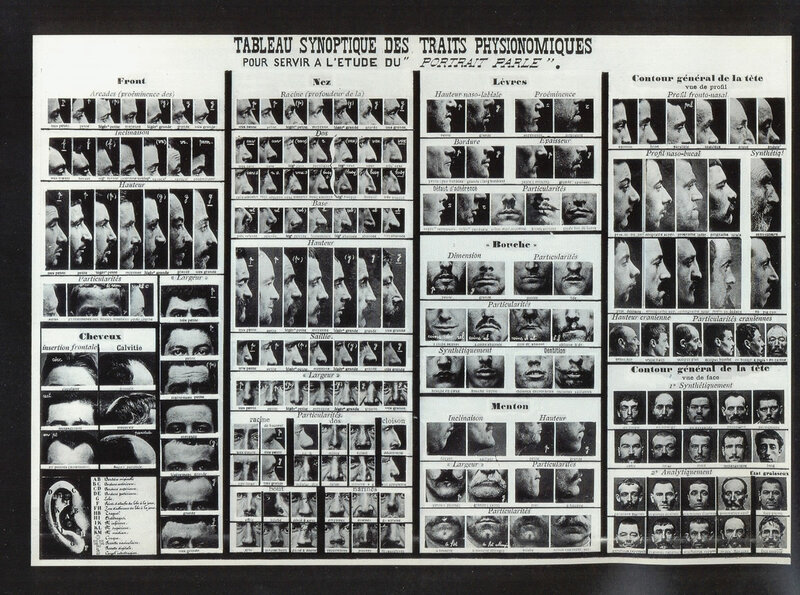 Unwilling to depict the patients’ faces, she transformed them into “surrealist” floating heads among verdant backdrops in the vein of the early French pictorial categorization of the criminally and mentally insane done by Alphonse Bertillon. Knezivic cites the painter Théodore Géricault’s portraits of distressed and forlorn looking faces disembodied by dark clothing and backgrounds as an inspiration as well as the surrealist Russian writer Danil Kharms. Garden 2 works counter the documentary, and therefore sociological, characteristics of this kind of image. Instead, Knezivic’s abstraction of the head reestablishes a privacy and space for these individuals who were previously only awarded partial subjectivities. By being abstracted into a symbolic sphere, their “shattered” state is again made whole. That's all. Alderman Exhibitions will be showing an encore presentation of Long Fuse this coming Sunday at 5:30 with gallery hours on Sundays, 12-5 PM through March 18th.